MOSCOW, December 26. /TASS/. The Russian Сenter for reconciliation of the conflicting sides in Syria have carried out three humanitarian missions in the regions of Idlib, Hama and Rif Dimashq, the center’s head Lieutenant General Sergei Solomatin told reporters on Wednesday. “In the past 24 hours, the Russian center for reconciliation of the conflicting sides has carried out three humanitarian operations in Abu-ad-Duhur in the Idlib province, Skalbia in the Hama province and the Hirdjilla refugee camp in the Rif Dimashq province, handing out one tonne of fresh bread, 20 kilograms of candy sets, 300 kilograms of medication, 30 kilograms of children’s vitamins, along with books and stationery with a total weight of 45 kilograms,” Solomatin said. The center continues restoring infrastructure and creating conditions for the return of refugees. As of December 25, 2018, as many as 30,920 houses have been rebuilt along with 714 educational and 122 healthcare facilities, while 951 kilometers of motorways have been repaired. The Russian reconciliation center continues to fulfill assigned tasks after the completion of the military campaign in Syria. The center’s officers regularly travel around the country’s liberated areas to assess the humanitarian situation. 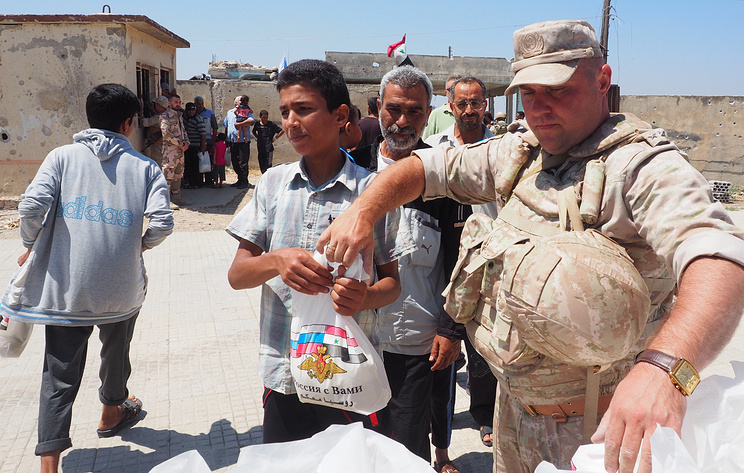 The main efforts of the Russian military are now focused on assistance to the refugees returning to their homes and evacuation of civilians from de-escalation zones. Hey Buddy!, I found this information for you: "Medicines, books brought to Syrians in Idlib, Hama, Damascus — Russia’s Defense Ministry". Here is the website link: https://russophile.org/medicines-books-brought-to-syrians-in-idlib-hama-damascus-russias-defense-ministry/. Thank you.